Take in the spectacular ocean view and enjoy tons of amenities in our 1+ bR/2 Ba second floor condo that comfortably accommodates 6. 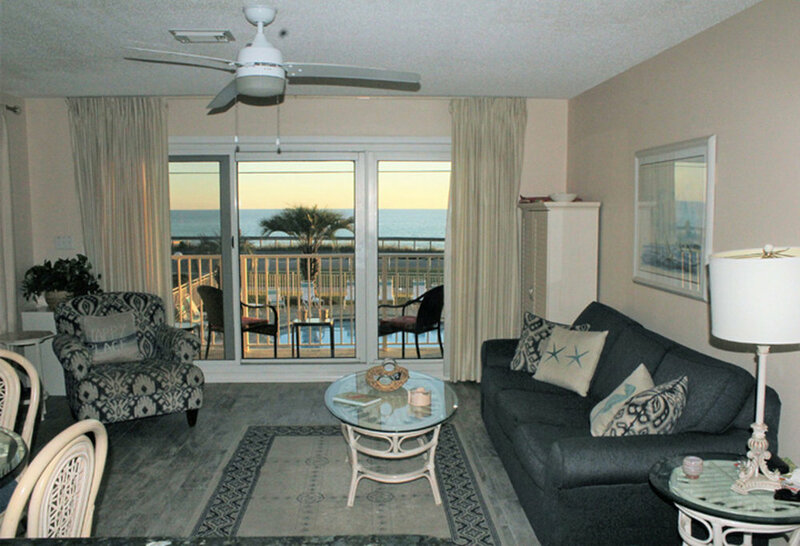 Located in Maravilla's front Building 2, with a direct view of the gulf. Get a well-deserved night's rest in the master suite's king bed with a comfortable mattress set. If you're not tired, stash your reading material in the 2 nightstands with reading lamps, or switch on the second TV. The master bathroom has a brand new shower/tub combination, built in high-powered hair dryer and plenty of towels for your convenience. Bring your extended family - this condo has 3 sleeping areas and can accomodate 6! There is a queen sofa sleeper in the Living Room and 2 twin bunk beds in the hallway, each with sheets and blankets, and access to a second bathroom with a shower, hair dryer and plenty of towels. Now with elegant wood look tiles throughout the condo! 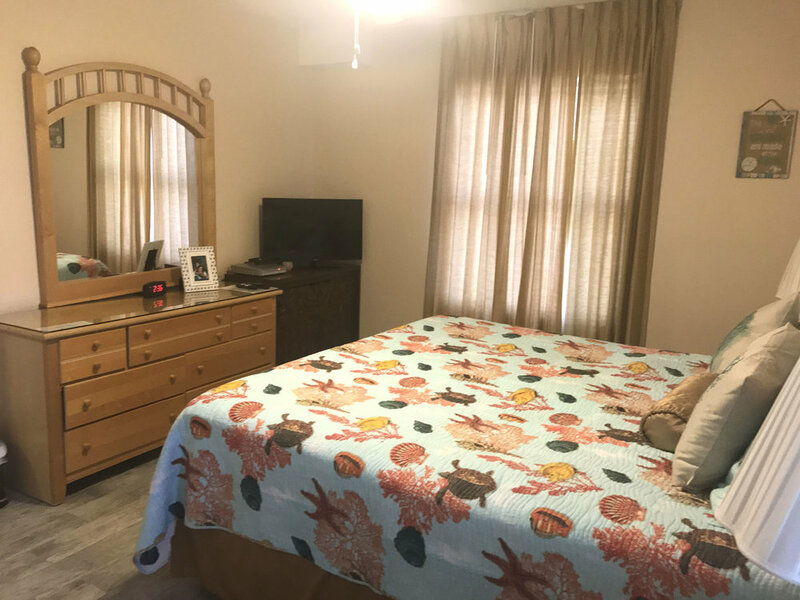 Our Maravilla condo was recently decorated in a soothing coastal style and renovated with wood look tiles throughout, new appliances, kitchen/bath cabinets and granite countertops. Enjoy a movie night on the 40" TV with HBO, DVD player, or turn up the tunes on our sound tower with Bluetooth connectivity. Get your Internet fix with blazing fast complimentary WiFi. Who's hungry? You'll find everything you need to feed your crew in our fully-stocked kitchen, from enough tableware to entertain a group of 10 to a daiquiri-ready blender and icemaker. In the morning, a coffeemaker (regular and K-cups), toaster, and kettle will get your day started off right. For you aspiring Julia Child types, we have pots and pans for everything from scrambled eggs to a good old-fashioned crab boil, and when you're done, the dishwasher will handle the cleanup. Our kitchen was recently renovated with a smooth surface stove and the cabinets got new pretty doors! Leave those umbrellas at home! There's complimentary beach service (daily set-up of umbrella and 2 lounge chairs on the beach from March through October) waiting for you to relax. You'll find the condo fully stocked with books, additional beach chairs, umbrellas, boogie boards, and plenty of beach and pool toys. Towels sandy after a long day at the beach? Throw them in our new in-unit washer/dryer and they'll be good as new for tomorrow's fun. Also, we offer keyless lock to make your arrival as painless as possible.